Music, friendly people, fantastic food - what do they all have in common? New Orleans, of course! 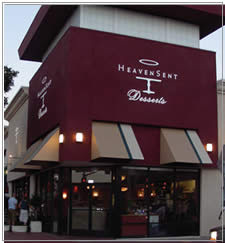 Heaven Sent Desserts is proud to feature our own very special Bourbon Street Bread Pudding for this month's 30th on 30th. We were given the recipe by a special lady in New Orleans but that's another story. Our delicious Bread Pudding, made from croissants making it light and truly tasty, smothered in our Heavenly Bourbon Sauce, will truly exercise your taste buds, so come early and taste it before it's all gone ... and take a dollar off the regular price, only for today - 30th on 30th.